How to make Floam - Easy Floam Slime Recipe the kids will love! Learn how to make floam! Your kids will be amazed and have a blast making this. 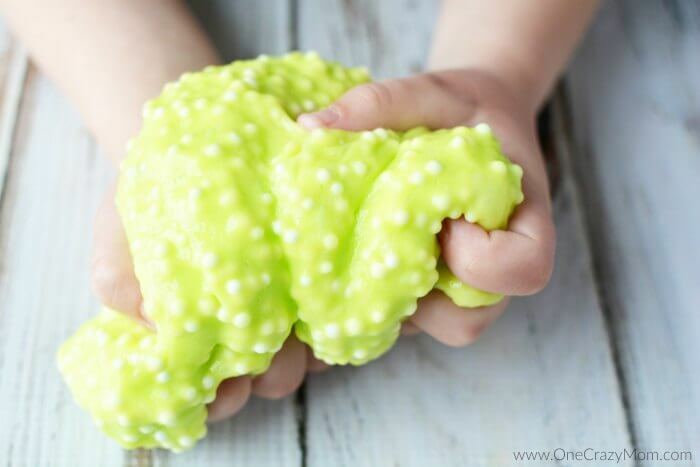 Plus, it’s not hard at all to make this floam slime recipe.It’s the perfect activity to keep the kids entertained. It’s so much fun making floam and playing with it. Are your kids obsessed with all things slime and floam? Mine are! I showed you how to make calming slime and how to Make Glitter Slime. Today, we are going to learn how to make floam! It only takes a few supplies and comes together quickly. It’s just as much fun to make slime as it is to play with it! Kids love floam! You can buy floam kits and slime kits but they can add up. If your kids like to make this stuff as much as mine do, it doesn’t take long for them to use a kit. It’s very simple to make your own and much cheaper too. Once you learn how to make floam, you will see how simple it is. The kids love it and stay busy. Plus, I don’t go broke buying kits! 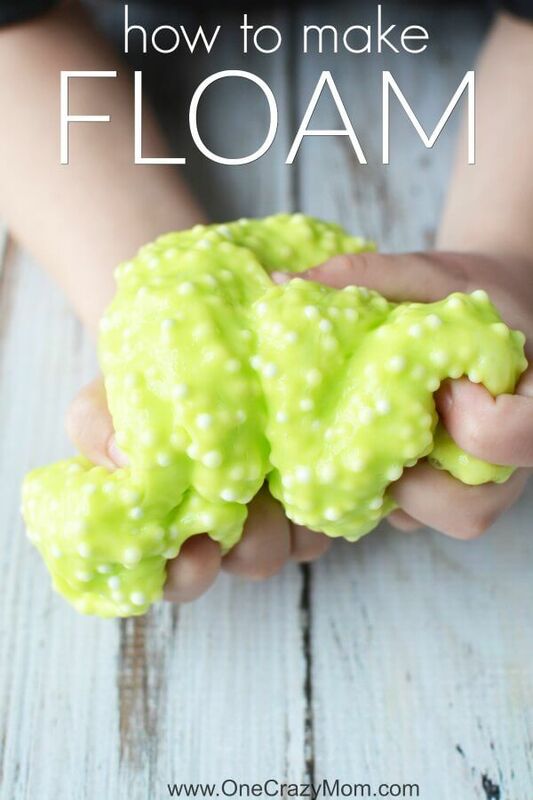 Gather the kids and let’s get started with this floam slime recipe! They will have so much with this homemade floam. 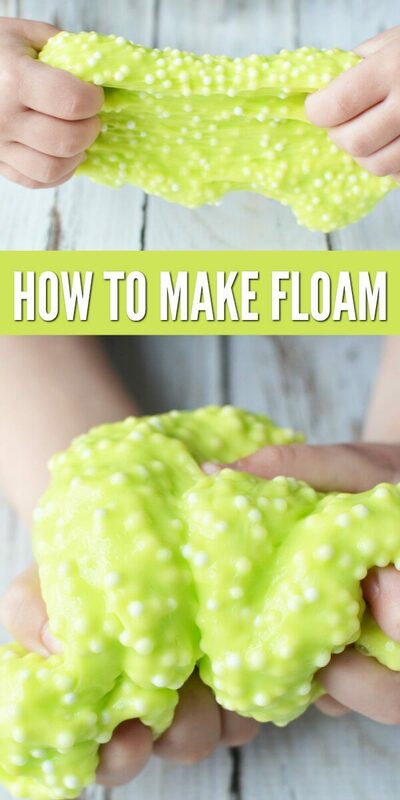 Foam slime is one of the most popular DIY ideas. It’s super easy and inexpensive to make. It would even be a fun birthday party activity. All kids love making floam so they would have a blast. You could set up stations and let the kids make floam. They sell little plastic containers in bulk on Amazon. These would be perfect for the kids to take their floam home in. Place hot water and glue together in a bowl and mix well so it’s combined well. Take your time on this, it will come together. Add food coloring, we used 5 drops of one color and mix well. Stir in starch and mix well. Continue to mix glue mixture, and eventually the liquid will begin to come together, as you will see the mix stick to the spoon and pull away from the sides. Place the mixture onto a large plate and flatten with your fingers. Place 1/4 cup of foam balls into the mixture and pull the corners of the mixture to the center and knead well. Add an additional 1/4 cup of foam balls and knead until combined well. Now that you know how to make floam slime, it’s time to play! You can store the floam in an airtight container or re-sealable plastic bag. 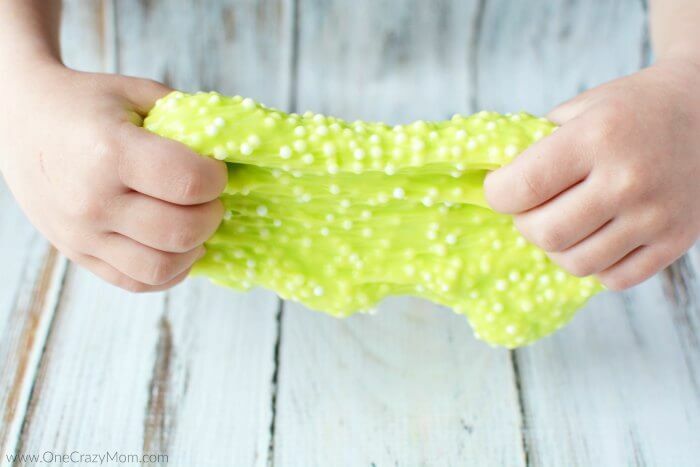 If you have always wondered how to make floam slime without borax, this recipe is great! If you have trouble getting the floam to the right consistency, just keep working with it. Sometimes it helps to stir it more until you reach the desired thickness and texture. How do you make homemade floam? I know some people use borax and that is certainly another way. In fact, there is an easy DIY for Homemade Floam here that uses borax. This is another option. Floam feels different from slime because of the styrofoam beads inside. It reminds me of a bean bag. So fun! I hope that this activity is fun for you and your kids. It’s the perfect activity when it’s too hot outside or raining. I like to have a few activities I can do inside so the kids won’t go stir crazy. We also like making DIY Bouncy Balls and Easy Homemade Playdough Recipes .They are both so fun for indoor activities. Of course playing outside is so much fun but when it’s hot or rainy, you just need some fun indoor activities. We are always making something, and the kids have a blast. It doesn’t have to be expensive or time consuming. Try some of these other activities and let us know how you like them. You might also like to check out 100 Days of Kids Summer Activities + Free Printables. There are lots of ideas for Summer or school breaks that you will love. Make a list and be intentional this summer. It is so easy to let the summer just pass by without knowing what even happened. Learn how to make glitter slime that is simple and easy. The kids will love making glitter slime and you will love how easy it is. 13 Quick and Easy Patriotic Decorations You can Make Today!